The gameplay and music are awesome. Also I didn't found any bugs, good job. Controlling a character feels a little wierd, but I got used to it. Overall this game is a great time killer! This game is so cool although the controls are really really hard to play with. but with a little improvement this could be a really great game. One of the most original concepts here, and the music is very cool. The controls were very hard to use though. Possibly my favourite out of the 40-ish I've seen so far. Very interesting and unique mechanics and gameplay which sort of link back to the theme of game development, pretty much the best soundtrack period, some neat visuals and some very cool programming of the hands, overall just a fantastic game and I'll be surprised if you aren't featured in Blackthorn's top 10 video. EDIT: Oh yeah forgot to say there's one HUGE FLAW in this game, the controls are awful to the point where often I feel like I'm wrestling with the controls rather than the actual challenge of the game. Please, if you make this into a full game (which I would highly suggest) just swap out all that dash bs for a simple doublejump, it will turn the game from maybe an 8/10 to a 10/10. Other than that though, top notch. Very interesting and fun concept. The biggest issue is that the controls feel quite clunky and make climbing around a lot harder than it needs to be. My personal suggestion would be to make space be the jump button instead of W and you also press space again in midair to do the double jump. 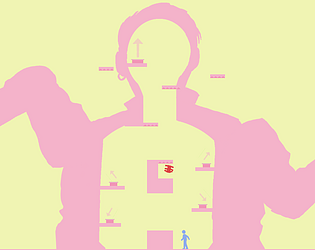 I really liked the idea of what your game was about, but I had a difficult time actually playing it as the movement and some of the gameplay was confusing/clumsy. Otherwise this was pretty impressive work.